Last week both kids were home for Easter break so went to a few places. Our first trip was to the Explore-At-Bristol Science Center. There's no static displays; it's all hands-on. Very, very good and well worth the trip out there. Not as crowded as the London Science Museum. We also saw a 3D movie at the IMAX about sharks but it was so-so. 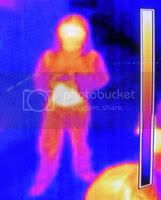 The picture is a thermal image of R*. It was the first time we had driven into Bristol as we usually just scoot past it on the motorway. First impressions were of a bland stock of post-war buildings but lots of bustle and obvious movement to renovate and modernise.